This post is dedicated to Kris Anderson, who turned up in my life five years ago and has taught me how to breathe again! See Kris’s Tarot website and facebook page. 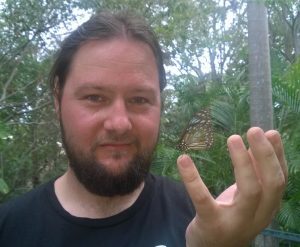 You can also book a reading or Reiki with him on 0428 626 727. -Built a 16 year career in the ultra-competitive world of film and TV. -Produced, directed and edited a Logie-nominated art show, 24 episodes of This Town Brisbane, and the Conscious Wisdom podcast (see our 11:11 Clocks and Past Lives episodes). -Represented QLD in State Gridiron and gained a Black Belt in Aikido. -Survived many traumas, including early loss, extreme psychic awakenings and crippling pain (from Scheuermann’s Disease). 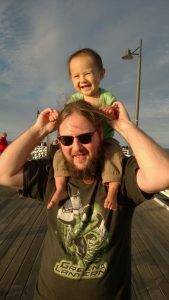 -Created a joyful life juggling film work, psychic readings and fatherhood despite all the odds and pressure to conform. Good news! Kris is taking over psychic readings while I’m on maternity leave between August – December 2017. We’ve been practicing together for a while, and clients just love his take on Tarot and numerology lifepaths. One of them (a Master 29/11, like me) said ‘that was the best reading I’ve ever had’. 2) He’s the most loyal guy I’ve ever met. Despite being made redundant three times from the same station (31 Digital), he kept returning to volunteer until they hired him again! Not many people would be that humble, but as Kris says ‘it was my passion’. As he jokes ‘I was like the lounge there – I might have smelled a bit funny, but boy did people find me comfortable’. That quality (commitment, not body odour) has made all the difference to our relationship. We literally met on his TV show, because he never gave up on his calling. BTW, he smells great to me! 4) Butterflies love him! I’ve written before about butterflies following me and Kris. I’ll never forget the day a blue butterfly got stuck inside our greenhouse. It kept hitting itself on the walls, which was awful to watch. A black butterfly came in, as if to guide it home, but the blue butterfly ignored it, and kept destroying itself. As I watched Kris catch the blue butterfly with his bare hands, I knew this was a metaphor for us. The blue butterfly just needed to ‘get out of its head’ and take a break. You can see it resting on Kris’s finger in this photo, after he rescued it. As a Master 29/11 lifepath (find your lifepath), I’m prone to impatience and idealism, which are the flip sides of being highly motivated and inspired. Kris is my rock when I’m too airy – he helps me to slow down, instead of succumbing to my nerves. 6) He’s shown me the power of inner strength. Despite having a black belt in Aikido, he’s never had to use his skills to defend himself. As he explained ‘people can just sense it’. Similarly, I’ve done psychic readings for countless business owners (especially healers), who think they need umpteen qualifications to be taken seriously. As I tell them, from the bottom of my heart, ‘clients are coming to see YOU, to experience YOUR energy. What you do is only 20% of the equation, who you ARE is 80% of the drawcard’. This is something I learned through trial and error. People like my numerology and palmistry, but they LOVE my honesty and life story. The reason I attract 11:11 See’rs, and am always busy, is because I’ve had a big life. I’ve moved to countries where I don’t speak the language, I started my psychic business with no support, I’ve had a baby despite desperate insecurity…all these experiences and more, have given me the kind of confidence you can’t buy. Kris has also survived so much, that just being around him gives me comfort. I know we are equals, because we both started seeing 11:11 around the time we met, which is a sign of Soulmates, Twin Flames and finding your tribe. More on healing your love life. 7) He’s a very old Soul. Kris is a 28/10/1 lifepath (which is the vibration of words like NEW AGE, HERO, SAMURAI* and GUIDE), which gives him charisma, courage and single-mindedness. *he’s also part-Japanese, loves manga and Asian food/ people (obviously, since he’s married to me). He’s also got a 9 Destiny (the sum of all the letters in his birth name – see the system). As I write in my post about 9 Lifepaths in numerology, this is the number of an Old Soul, who’s had many lifetimes on Earth. 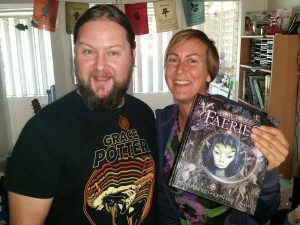 Here’s Kris with Deniz Akan, our crystal healer friend, both of them love the Faerie Oracle deck and books. Our Destiny number influences our career (how we make a name for ourselves – mine is a 4, which means my business is about healing hearts). Kris was always destined to work with people from all nations, on global projects. 9’s show us how to let go – to die to our old selves. Many times, during fights, he’s said, ‘remember Sarah, it’s all just a game’. I’ve waited lifetimes to meet someone as conscious as Kris. It’s not an easy ride – being with your Soulmate pushes all your buttons – but at least I can trust him to always call me on my ego bluffs. That’s a huge relief! Kris has always joked ‘I’m more psychic that you, Sarah’, and it has to be said, we are uncannily telepathic. If he needs toothpaste, I’ll buy it on the way home (without him even calling me). If I’m craving pasta, he’ll start making it before I open my mouth. I’ve learned to trust Kris’s intuition over the years. He is beyond psychic, especially when it comes to reading people and expanding our relationship. It’s like he’s read our Soul Contract inside out and knows just what we’re here to accomplish together. 8) He’s got a soft spot for pizza, beer, and unicorns. See photo – he’s training Forrest to home-deliver! I always knew I’d meet Kris, even when I was little. I used to look up to the sky and think ‘my husband is eating a pizza for dinner…and now he’s brushing his teeth…’ Years later, I had my hands read in Rishikesh, India, and the palmreader said ‘there is a man for you…fat with a Moon face…if you marry him you will marry once, if you don’t, you will marry at least twice’. At the time, I was like ‘are you kidding?’, but when I met Kris, I said ‘did you used to be fat?’ and he agreed. As a teenager, he played State Gridiron for Queensland and was very stout. He’s also got strong Lunar (Moon) energy in astrology and palmistry – see this post on the Luna Mount. To quote – “In palmistry, we believe that people with a fleshy Luna Mount (the side of your hand below your Pinky to the wrist ) are strongly impacted by the Moon’s cycles. The Luna Mount gives away your emotional balance. People with a full mount are peaceful, artistic and sentimental types, who love being near water and relaxing. Often they enjoy a drink or two.” Yep. 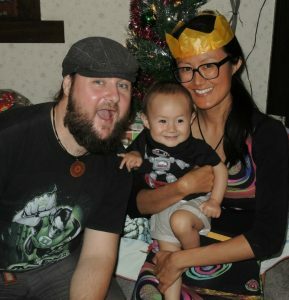 Kris may be a deeply compassionate Soul, but he’s also a typical bloke…!! For example, he’s obsessed with guitar metal, Dr Who, unicorns and all things 1980’s. 9) Kris is a prankster Dad. To my dismay, it’s obvious that Forrest thinks Kris is funnier than me. I can dance until the cows come home, and Forrest will stay poker-faced. But if Kris makes a fart sound, Forrest starts laughing harder than than Tickle Me Elmo on red cordial. 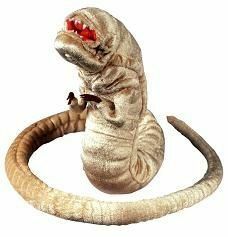 Kris also has a penchant for tickle wars, making jokes about beards, and hiding the Chestbuster toy from Alien (see photo) in the house, which always makes me scream. I once read that, the most important quality is a good sense of humour. Kris ticks that box for sure! Yes, this article is a plug for Kris and his Tarot readings (which include lifepath numerology too). However, it’s also a love letter from me, to him, for all the times I’ve not been able to express myself properly. 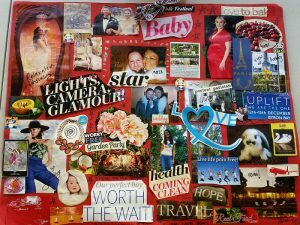 Kris, remember when I made this vision board? Thank you for never giving up on us. Thanks for reminding me that I’m not my results, or my brain. Thanks for holding me when I lose it. Thanks for the bacon pancakes. Thanks for having kids with me, even though the first (and second) time I mentioned it, you projectile vomited in shock (and blamed an egg sandwich). It was worth all the drama, I think you’ll agree. Thanks for marrying me, even though I’m not totally certain we’re married because I said ‘Sure’ instead of ‘I do’ to the celebrant when she asked me to take you as my lawfully wedding husband…! Most of all, thanks for joining me in life, love and business with such gusto and energy. I look forward to having our next baby Charlie soon, and having more incredible adventures with you in years to come. May the family circus begin! -Book a Tarot Reading or Reiki Session with Kris (Chermside West, Skype or at your home in Brisbane) Prices from $200/ hour for a reading. Or call 0428 626 727 to speak to Kris. He’s also on facebook, please like his page Kris Anderson Tarot for updates and special insights. 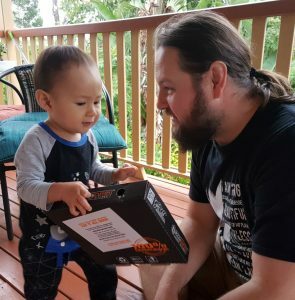 Happy 1st Birthday Forrest, Here Comes Your Sibling! Or, for greater clarity, book a reading with me to discover your soul contract and 2018 forecast. it’s worth the suspense – see feedback. For a reading within 7-14 days, book a Tarot reading in Brisbane with my husband Kris on 0428 626 727. I also recommend Vicki Haspels and Caroline Byrd, my spiritual mentors and gifted mediums.